RaÃºl and Marcos Senna hoist the Soccer Bowl Trophy and retire as champions. Three years. Two championships. The perfect sendoff for two retiring Spanish greats. “Today was my last game, I’m happy, but honestly very, very sad,” said Raúl, one of the Cosmos’ two retiring Spanish stars after the New York received a hat trick from Gastón Cellerino to defeat Ottawa Fury FC, 3-2, and win the club’s seventh NASL title and second Soccer Bowl trophy in the past three years in The Championship. 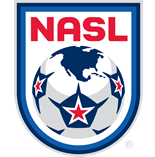 Before 10,166 fans, a Modern Era record for a postseason match, at Shuart Stadium on Sunday night, New York ended Ottawa’s 12-game unbeaten streak on the road while winning its sixth consecutive match spanning the regular season and two games of The Championship, the NASL’s four-team postseason tournament. For their efforts, the Cosmos took home the Soccer Bowl trophy awarded to the best team in the North American Soccer League. That, perhaps, is the understatement of the year. The final 20 minutes of regular time, plus four minutes of second-half injury time were positively heart-stopping. With the Cosmos leading, 1-0, on Cellerino’s goal in the game’s eighth minute, Ottawa’s Mason Trafford was shown a straight red card in the 68th minute. “We felt very good at that point,” Savarese said. And why not, at least for two minutes. It was then that Fury FC, a team with no quit in them, tied the match when Andrew Wiedeman slid a through ball to Tom Heinemann. He used the outside of his right foot to beat Cosmos goalkeeper Jimmy Maurer to the near post and knot the score at 1-1. The Cosmos again grabbed the lead, only minutes later, in the 72nd minute. Walter Restrepo collected a crossing ball on the right and took it to the end line. His looping cross eluded the jumping Romuald Peiser, the league’s Golden Glove Award winner, and floated to Cellerino, who was standing at the far post. He nudged it over the goal line for his second of the game and third of The Championship. Cellerino, the Cosmos’ Argentine target man up top who joined the team only three months ago, scored again, in the 85th minute, converting a perfect lead pass from Raúl for the goal that proved to be the eventual game-winner. It was Cellerino’s fourth goal of The Championship. 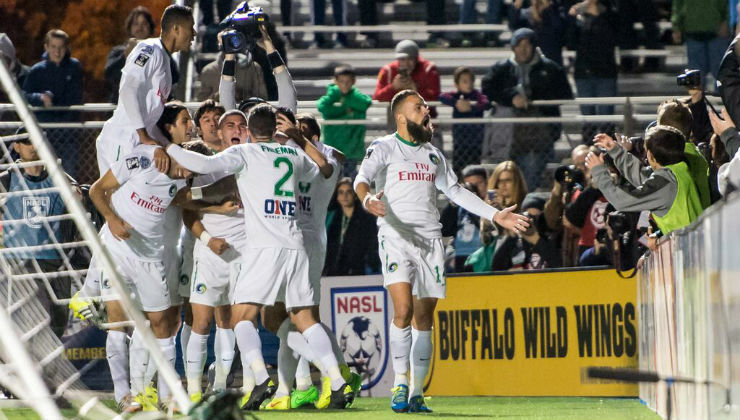 He scored the equalizer for the Cosmos in their 2-1 semifinal win over Fort Lauderdale on Nov 7. Ottawa, which entered the game with one loss in its past 26 matches, refused to capitulate. It was Heinemann again, the striker who scored both Fury FC goals in last week’s semifinal win in extra time over Minnesota, that gave Ottawa some flickering hope when he scored two minutes into second-half injury time. But the Cosmos held on, winning the title in the same place where the club won its first NASL championship, in 1972, defeating the St. Louis Stars, 2-1. For Raúl and Marcos Senna, it was a fitting and touching end to their storied professional careers that brought them acclaim and championships for their club teams and the national team of Spain.